I visited Malaysia again recently, and stayed one of the Kuala Lumpur Hotels – Ramada Suites Kuala Lumpur City Centre. 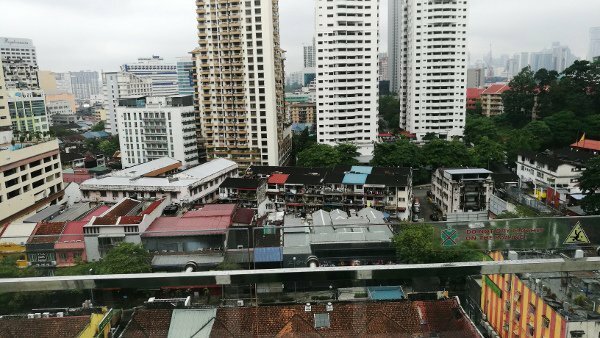 In this Kuala Lumpur Hotels Review, I will share with you my experience at the hotel, what is around the hotel, what are the nearest attractions, how to get to the hotel and around Kuala Lumpur. It was time for another vacation. A friend from Malaysia proposed a road trip – Kuala Lumpur, Ipoh then Penang. That sounded fun! The thought of visiting more interesting places in Kuala Lumpur like Thean Hou Temple, Central Market, Petaling Street, Petronas Tower, and more was so inviting. Plus, all the delicious food to enjoy like Madam Kwan’s, DC Comics Superheroes Cafe, Kinjuku, and more! And that is just in Kuala Lumpur. There are more good food in Ipoh and Penang. Resistance was Futile! First stop was Kuala Lumpur. Needless to say, I turned to trusted Agoda to find a good hotel to stay at. 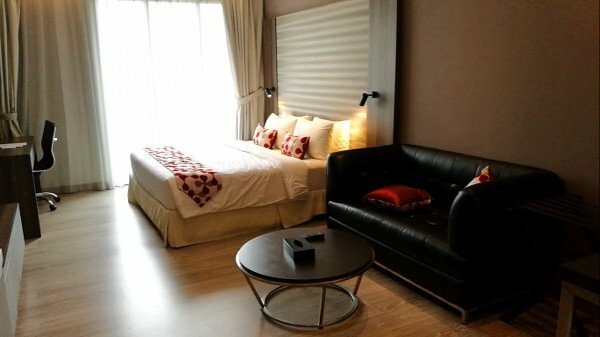 I found a fantastic deal for one of the Kuala Lumpur Hotels – the Ramada Suites Kuala Lumpur City Centre. Please continue to read for my review of this hotel. Room Rates: US$72 – US$133 (based on average rates for a standard suite) and above (depending on suite) per night. 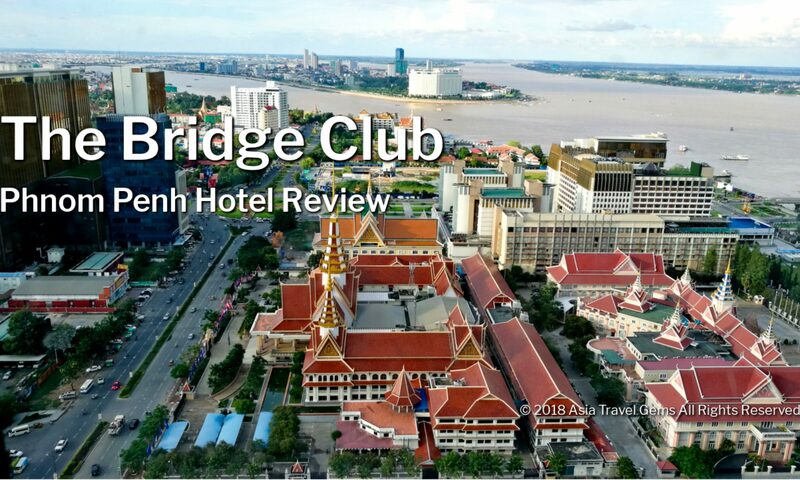 I managed to get a very good deal at Agoda – US$51 per night only. Location: No 1 Lorong Ceylon, Bukit Ceylong, Kuala Lumpur 50200, Malaysia. Value: At the price offered at Agoda, definitely worth it! Sleep Quality: The bed was all right, but the pillows were a bit soft. Still, managed to get good enough sleep. Cleanliness: Very good. Could be better. The hotel name is Ramada Suites Kuala Lumpur City Centre. Quite a mouthful. And sometimes you might see the name listed or written as Ramada Suites KLCC. 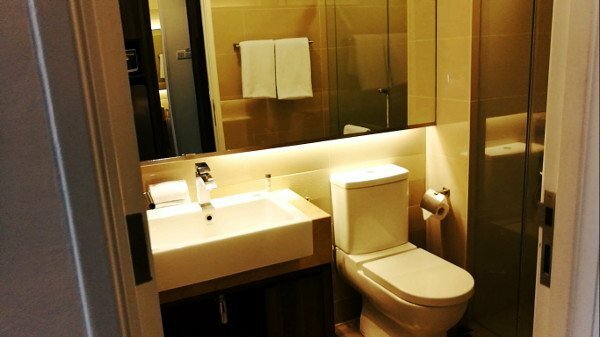 Do not be misled when you see it as Ramada Suites KLCC. It is not located at or anywhere near KLCC. 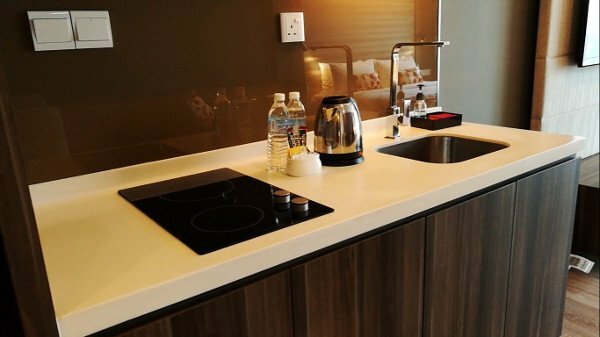 Instead, the hotel is nearer to the popular shopping belt known as Bukit Bintang. It is just a short 15 to 20 minutes walk to malls like Pavilion, Lot 10, and Sungei Wang. And even shorter distance to Low Yat, the IT Mall of Kuala Lumpur. The Ramada Suites Kuala Lumpur City Centre has 107 rooms or suites, as the hotel prefers to call them. 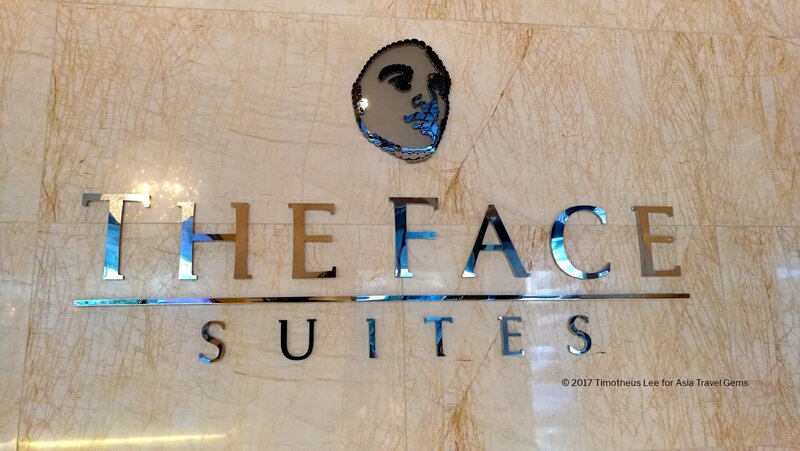 Personally, I do consider the rooms a little too small to be called a suite. At the same time, it is a little larger than most rooms. Furnished in contemporary style, each of the suite comes with king-sized bed or twin beds. There is even a choice of executive suite. 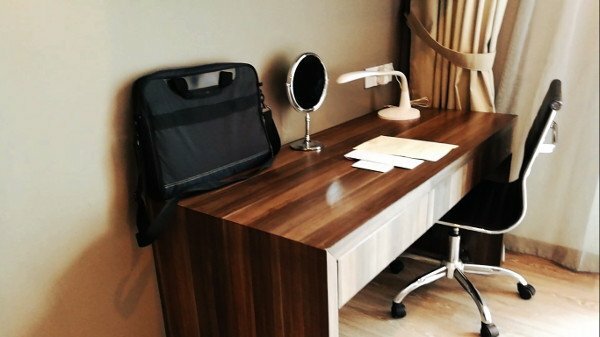 The rooms or suites include a closet, a kitchenette, an en suite bathroom with rain shower, a sofa to watch shows on a 50 inch TV as well as a simple work desk. Due to its location near the shopping belt, and within the city, all the rooms have a city view. Tip: Hotel is in an area with many restaurants and pubs. Can get noisy at night. Try to ask for a room that is in the quieter side. No promises they will provide though. I was fortunate to get a quiet room. 24-Hour Reception Desk – Service was cold and unfriendly. The reception staff were polite but did not smile at all. They might as well just install robots to do the job. Tip: Do check if your booking includes the breakfast. If not, then you will have to purchase it. Onsite Parking – Available but for a fee. Even for guests. We were not happy to find out that even guests have to pay a fee to park here. It should be free for guests! Kitchenette – With hob and hood, a kettle, fresh water in bottles daily provided, coffee and tea packets with sugar and creamer, a small refrigerator and a microwave oven. It is nice to have the refrigerator. I love to eat tropical fruits, and it was nice to store them in the refrigerator. 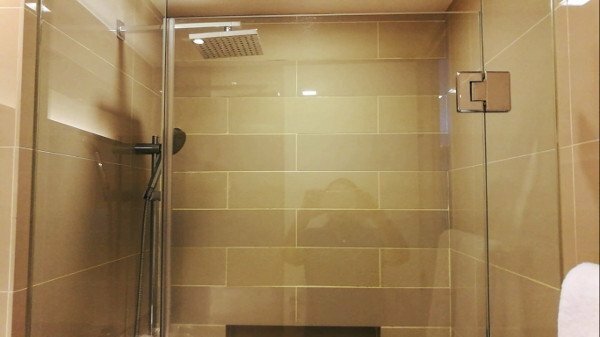 En Suite Bathroom – Has towels and well stocked with shampoo and conditioner. There is also a hair dryer. What really pleased me was the Rain Shower. Loved it! And the water pressure was very good too. Safe – Great for keeping my valuables safe while I explore the city. But I discovered a hiccup, something for you to be careful about. Read the tip below! Tip: The Safe! Be careful to use the safe in this hotel. One evening, I needed to check my passport that I kept in the safe. I could not open with the code I previously entered. I tried many times before I gave up and called the Front Desk. I was duly informed that they could not do anything because only the Manager can resolve this. And the Manager is only back in the morning. I was horrified! What if we needed something urgently from the safe? What if our flight was that night, and we needed our passports? The Reception gave the standard answer – wait till morning for the Manager to arrive. Terrible! Lounge/Bar/Restaurant – Goa by Hubba is on the ground level, next to the Front Desk. They serve a wide range of food, from local to American. There is also a bar scene with live music. I had a couple of hours before my flight, and I spent it resting at this place. The drink was all right. Infinity Swimming Pool – Infinity Pools are so popular these days. But it is not good to have one for the sake of having one. I think this happened here at Ramada Suites KLCC. The Infinity Pool is lack lustre. There is no great view, only view of the city that are just buildings. It was not worth taking photos or videos of this facility. There are no attractions nearby, unless you count Bukit Bintang, which is a shopping belt. There are large malls, small shops, cafes, restaurants, bars and food courts in this area. One popular eating place is Jalan Alor, which is a famous food street. You can find many tasty local food served at the restaurants and food stalls along Jalan Alor. While there are no attractions near the hotel, there is the Bukit Bintang Monorail station that is only 15 to 20 minutes walk away. You have access to many attractions in Kuala Lumpur from this station. 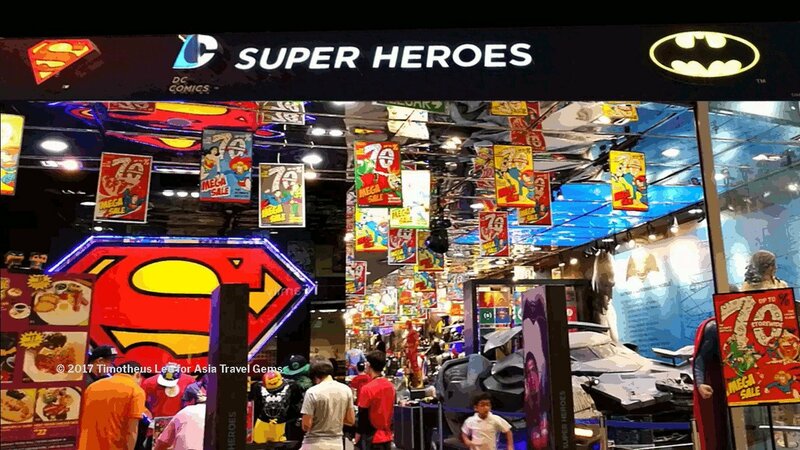 The attractions are such as those mentioned earlier – Thean Hou Temple, Central Market, Petaling Street, Petronas Tower, and more. Where is Ramada Suites Kuala Lumpur City Centre? Address: No 1 Lorong Ceylon, Bukit Ceylong, Kuala Lumpur 50200, Malaysia. It is easy to get to Ramada Suites KLCC from the airport. One way would be to get one of the taxi services at the airport or use Grab. My choice is Grab as it is easy to use. Tip: For some reason, drivers are not able to find the hotel, even if you give the right address. Get the phone number (shown above) ready. If need be, call hotel, ask them to direct driver. That’s what happened to me, and what I did. Light Rapid Transit (LRT) – The nearest Monorail station is Bukit Bintang, and takes about 15 to 20 minutes walk to reach there. The monorail can bring you to almost anywhere within the city. KL Hop-On Hop-Off – This is a City Tour Bus that can take you to many attractions. Go to their website to find out the various routes, fares and destinations. GoKL – This is a Free City Bus Service for visitors. It travels on selected routes in the city. Go to the GoKL website for more information. The hotel would have received a much lower rating. This was because of the very poor service at the Front Desk. To me, everyone working in the hospitality industry should have good customer service, and know how to smile. I arrived at the hotel to sullen faces. Not even a greeting. Just robotic actions to register me and quickly get me away from the Front Desk and to the room. I do not know if it was because I was Asian? I witnessed the Front Desk staff behaved much nicer to a Caucasian couple. No matter what, no excuse for poor service. What made it worse was the inability to open the safe at night when the Manager is not around. Could they not arrange for the most senior person in the night to assist with this? What saved the hotel, and helped them achieved an average 3 instead of a 1.5 or 2 are the room, cleanliness and location. 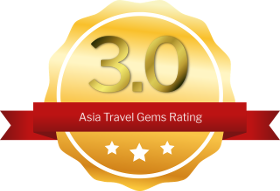 If you have ANY questions about Kuala Lumpur Hotels Review – Ramada Suites Kuala Lumpur City Centre, ANY at all, please submit your questions as comments below. I will be happy to help you out.